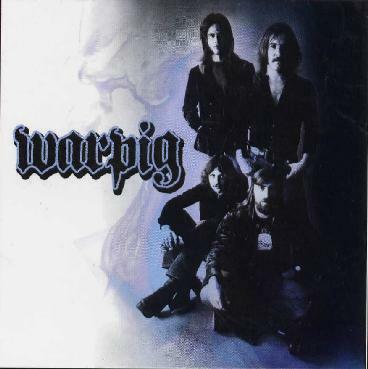 Warpig were a Canadian band that released one record back in 1971. This is part of a series of reissues of classic records from the 70's on the Relapse Records label. The CD has been remastered, not sure if from the original tapes, and includes extensive liner notes (the bio says). The CD opens with the tune Flaggit, which certainly has an early Blue Oyster Cult feeling to it, but actually precedes BOC's first record by a year! Doubt they knew of each other. Tough Nuts is a very short but Heavy Black Sabbath like track with a cool riff. Melody with Balls is the first of 3 longer tracks that allow the band to stretch out and show some interaction between the guitar and the keyboards (which are pretty low in the mix most of the time), including a slide guitar solo that goes into a pretty spaced out psychedelic section before the song kicks back in. Advance in A Minor is nearly all instrumental and begins with organ-piano as the track slowly builds up and includes some strange yodelling like vocal. The track comes across as a strange jam. Rock Star is next and has a cool heavy bass driven groove that reminds me of the Groundhogs. This and the first track are probably the most straight forward rockers. Both cool tracks. Sunflight is next and is quite a Uriah Heep inspired track. U.X.I.B. starts with what sounds like harpsichord before picking up with one of the heavier guitar riffs on the CD. A really good song. The CD ends with the Moth. Pretty cool and obscure record from 1971.